On these pages you will find various reports and magazine articles on all aspects of Jawa and Babetta mopeds. These are general interest articles or ones covering more than one moped type, for articles about specific models see the “literature” pages for each model in the “Manuals” section. Click on the pictures below to see a full size copy of the article. This is the report of a 490 mile trip in 24 hours on a Jawa Moped in the 1993 ACU National Navigation Rally. Part of a speech to the UK press announcing plans for the Freewheeler and Mustang for 1980. A table of 50cc models sold in the UK by year. Not yet complete but it’s a start. Another item from Czech Motor Review issue 8/1981 covering the full range of production. An interesting poster from the Jawa importer Industria ltd.
A test between a Jawa 207, a Baron Economy, and a Mobylette 50VS from UK magazine Which Bike? from 1977. A bit of tourist information about Kolárovo where the later Babettas were made. A brochure, in Czech, for the model 207 moped, 220 scooter & 223 Mustang. By Babetta Round the Sahara. A journey across Africa and through the Sahara desert on a pair of Babettas. This YouTube video is a James Bond themed advert for Coke Zero filmed in Prague. 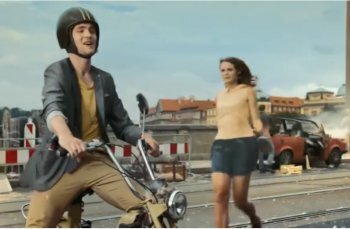 The hero is riding a Babetta model 210.
click on the picture to view the film on YouTube.